Martin Christopher Padilla, 39, adored and admired Father, Son, Grandson, Brother, Uncle, and Cousin. 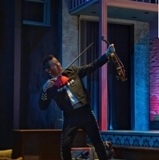 A Brilliant and Accomplished Musician whose natural talents included his Angelic Voice, Instinctive Songwriting Composition, and rapid abilities to learn and play a plethora of instruments such as the Piano, Guitarron, Vihuela, Harp, Cello but most masterfully his cherished Violin. Such a passionate Mariachi Musician, Teacher and Friend with a generously joyful, playful, and loving contagious spirit! Martin is a born again Christian, active church member, and joined Great Grandpa Verdi Blake, Grandma Joan Collins, Grandpa Martin Padilla, Dad Martin Padilla Jr., Uncle John Collins, Aunt Linda Collins, and Jesus in Heaven on January 25, 2019. Survived by daughter Danielle Padilla, Mother Anita Celum, Grandmother Hermelinda Padilla, Stepdad Garry Celum, Brothers Stephen Padilla and Matthew Padilla, Step Brother Michael Celum, Step Sister Dawn Celum, Nephews Aven Padilla, Sebastian Celum, and Israel Kristopher Delucersa, and Nice Mckayla Celum. The extended family includes an additional 2 Uncles and Aunts, 6 cousins, 11 nephews and nieces, and the entire Mariachi Family World Wide. Celebration of Life will be held on Saturday, February 02, 2019 at Valley View Baptist Church, 1500 Mescalero from 1pm-5pm. He will be dressed to impress so you can physically hug and kiss him. He will be loved by all for the rest of our days on Earth and for eternity when we reunite again in Heaven. The family will be hosting a reception in his residence at 6333 Aztec, just a few houses from the church. God Bless us all … Remember that Jesus Loves You!